Cranleigh Rotary's Carol Concert, held in Cranleigh Baptist Church on 7 December, once again heralded the start of the festive season. 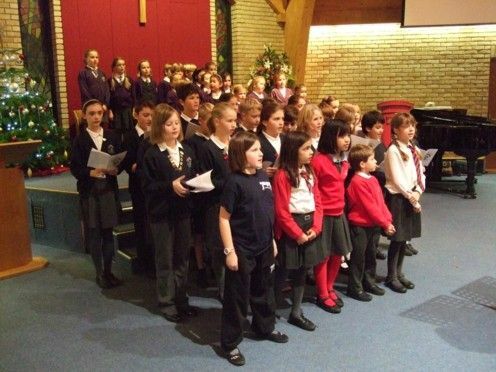 Choirs from three local schools - Cranleigh Church of England Primary, St Cuthbert Mayne and Wonersh & Shamley Green - took part, and the audience enjoyed singing along with a selection of carols. 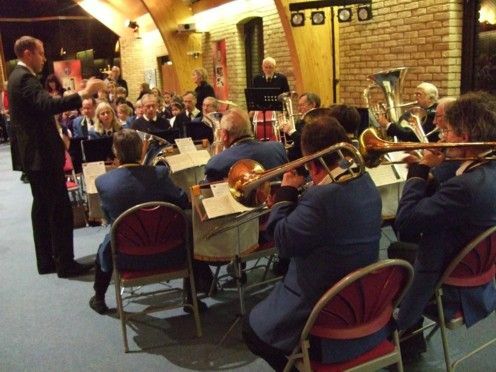 Musical accompaniment was provided by the Godalming Band and Guildford Salvation Army Band. The MC for the concert was Rev'd Ian Maslin, the Curate at St Nicolas Parish Church in Cranleigh. Ian used a number of inflated, colourful balloons, to illustrate the importance of receiving presents - especially at Christmas - and ended by emphasising that the best present for all of us was Jesus, whose birth we celebrate at this time of year. Proceeds from the retiring collection will be presented to the Cranleigh Food Bank.